For a serene trip, think about getting a cover. We offer all kinds of guarantees to suit your needs allowing you to drive safely. Covers driver and passengers in case of serious personal injury. Full coverage for windscreen damage, tire punctures and glass breakage. 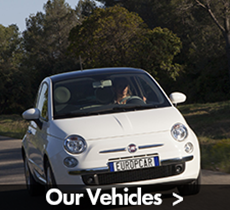 Substantially reduces your liability in the event of theft, attempted theft, collision or damage to the Europcar vehicle. Erases completely your excess charge in case of theft, attempted theft, collision or damage to the Europcar vehicle. Reduces excess amount in case of the theft or damages to the Europcar vehicle including simple tire punctures and glass breakage, and PAI. Entire coverage to the car, including Super PAI. Covers assistance to fulfill the accident report, and car towing in case of breakdown due to the Driver’s negligence.